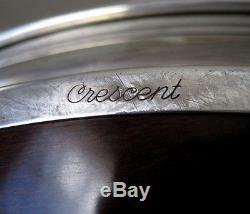 Fine Things 4 Sale - Family parts with a few treasures... Sterling and Silverplate items listed. 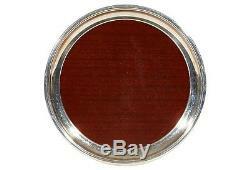 AN OLDER SILVER HOLLOWARE --- UNIQUE ROUND TRAY - SIMPLE RESTRAINED PATTERN ON THE EDGES SIDES - NEVER MONOGRAMMED OR PERSONALIZED - VERY COOL / NEAT PATTERN SERVING TRAY - Probably mid-century serving tray, --- WOOD LOOKING CENTER IS LAMINATE or FORMICA like non-porous material that won't stain - edge appears to be silver plate. This tray measures 16 wide and has a sturdy feel. It is in good to excellent, undamaged condition with typical wear. It is somewhat tarnished, so you may want to shine it up a bit. The bottom of the tray has a wood look - laminate. REALLY GREAT CONDITION, RARELY USED, IT WAS PERFECT FOR HOLDING A PLATTER OF COCKTAIL GLASSES. MOTHER USED THIS REALLY SPECIAL TRAY TO PRESENT CUPS OF COFFEE AT DESSERT TIME TOO... NEVER SEEN ANOTHER LIKE IT, I'm told it came from New York in the 1950's. 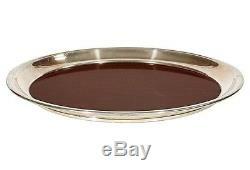 NOTE - only the tray is listed in this lot - view our other listings for goblets, decanters etc. Grand Classic Useful Host/Hostess item. Beautifully crafted with good heft these silverplated pieces were made to last. No longer made, this could be passed along for generations to use. All this was stored away, no damage well cared for and next owner will get to finish polishing'em up more or have professionally polished if desired. This all comes from a silver collection that I just pulled out of storage in the attic amassed by my mother & grandmother. NOTHING IN THIS COLLECTION HAS MONOGRAM or any other personalization. Older Heavy Top Quality Holloware Items! Great value -- Good to Very Fine Estate Used condition. We desire this collection to be used another family. A true silver / sterling person will like to have this chafing dish for party time, this year! Collector's items, yet eminently appropriate for contemporary use. My family invested in quality items for gracious living. CONDITION: NEAR MINT overall (this was used RARELY) almost none of the typical minimal use marks / spots etc. 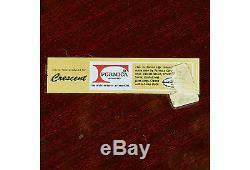 Not new, but Used Good Estate Condition with expected use on treasured old items. No Monograms or Removals not noted - Some hand washing/polishing needed! Vintage heirloom quality, these were used for 30+ years for entertaining, as the items were acquired post World War II. This is an outstanding, truly versatile, group/set of good weight/heft, elegant pattern. No major flaws or damages not mentioned, expect general marks, spots, scratches, wear and patina commensurate with age and use of treasured serverware/flatware used for special meals/holidays. All this has been stored away in the box for many years and a simple cleaning/polishing will make it look even more elegant on your table. Most or all hosts would feel quite comfortable using this when entertaining the most special guests in your home. Please review other listings now & later... (other family sets/collection) and very good quality estate things from Grandparent's cottage. More Sterling & Silverplate items to be listed. Sellers are not responsible for service transit time. Transit times are provided by the carrier, exclude weekends and holidays, and may vary with package origin and destination, particularly during peak periods. We no longer accept mailed payments. CONDITION: Every attempt is made to describe any damage or faults honestly & accurately. We pack carefully and this has never been an issue. We're sharing'estate items' generally older antiques and we shall have no responsibility for any error or omission. The absence of a condition statement does not imply that the lot is in perfect condition or completely free from wear and tear, imperfections or the effects of aging. The item "MCM MID-CENTURY or DECO STYLE EX LARGE SILVER EDGED'WOOD' SERVING TRAY MASSIVE" is in sale since Sunday, January 24, 2016. 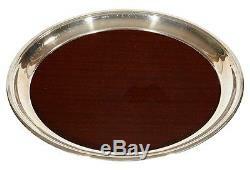 This item is in the category "Antiques\Silver\Silverplate\Platters & Trays". The seller is "finethings4sale" and is located in Chapel Hill, North Carolina. This item can be shipped to United States, to Canada, to United Kingdom, DK, RO, SK, BG, CZ, FI, HU, LV, LT, MT, EE, GR, PT, CY, SI, to Japan, SE, KR, ID, to Taiwan, to Belgium, to France, to Hong Kong, to Ireland, to Netherlands, PL, to Spain, to Italy, to Germany, to Austria, IL, to Mexico, PH, SG, NO, SA, UA, AE, QA, KW, BH, HR, MY, CL, CO, CR, PA, TT, GT, HN, JM.